A 300-space, heated, indoor bicycle parking facility located directly east of the northeast Exelon Pavilion at Randolph Street and Columbus drive provides lockers, showers, bike repair and other amenities. 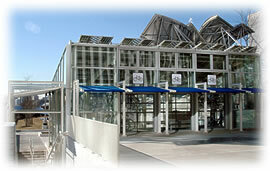 The bike shelter also incorporates solar technology in a photovoltaic system located on the roof of the facility. Spire Solar Chicago manufactured 80, 75-watt modules and 40, 37-watt modules for a combined photovoltaic system rated at 7.48 kW. The system is expected to generate 8,815 kilowatt-hours per year and meet 6.5% of the facility’s electrical requirements.